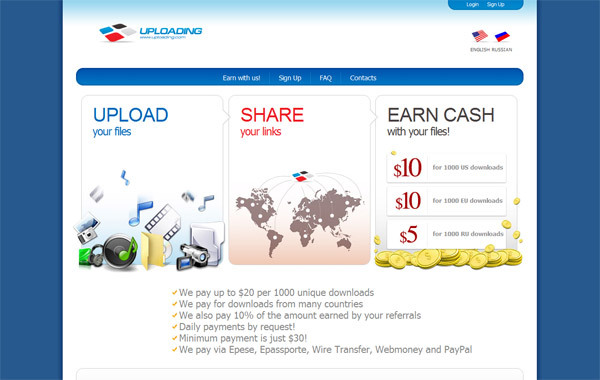 Uploading offers you to upload files with a size of up to 1 Gigabyte and then share the links in order to earn from each download. You can get between 1$ and 20$ for every 1000 downloads of files that you’ve uploaded depending on the file size and your current rank in the system. You can also earn additional 10% of all Premium account sales that you are responsible for in addition to payout for file downloads. Easy Share allows you to upload files with a maximum size of 1000 MB and then share the links to earn cold hard cash for downloads of these files. You will be getting between 1$ and 20$ for every 1000 files downloaded, depending on the country the users who download are from as well as depending on your performance level in the website. Unfortunately here you don’t earn additionally if you sell any Premium accounts indirectly, but you have the chance to buy and resell Premium accounts with discount, so still this is a good additional opportunity. FileSonic may be a new name, but actually this is the service that was previously SharingMatrix, so you can be rest assured they are reliable. You can upload files up to a size of 1024 MB with a payout rate between 1$ and 30$ for every 1000 downloads or 60% of all Premium account sales you generate, you can choose one or the other, but not the two at the same time. FileFactory provides you with an option to upload for free files of size up to 2000 MB and then to earn between 50 cents and 30$ for every 1000 downloads, depending on the country the visitors are downloading from and the file size. Plus, you can warn 10% of the value of all Premium account sales sold from your files or your site. 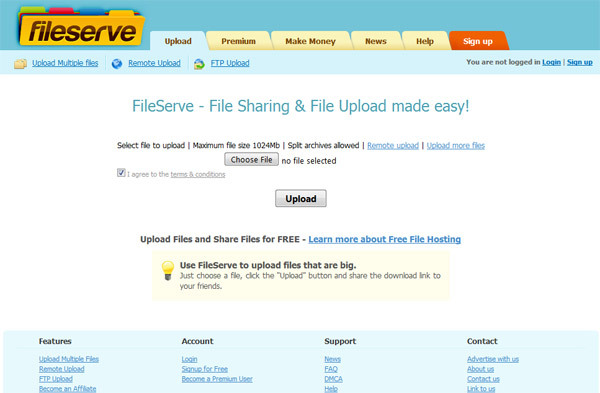 FileServe provides you with a free service to upload files with a size of up to 1 GB and then share and earn money from the downloads they generate. Depending on the locations of the users downloading and the size of the file they are downloading you can make between 50 cents and 25$ for every 1000 downloads of your files. Additionally you can earn 5% commissions of all Premium accounts sold via your own websites, blogs or forums.